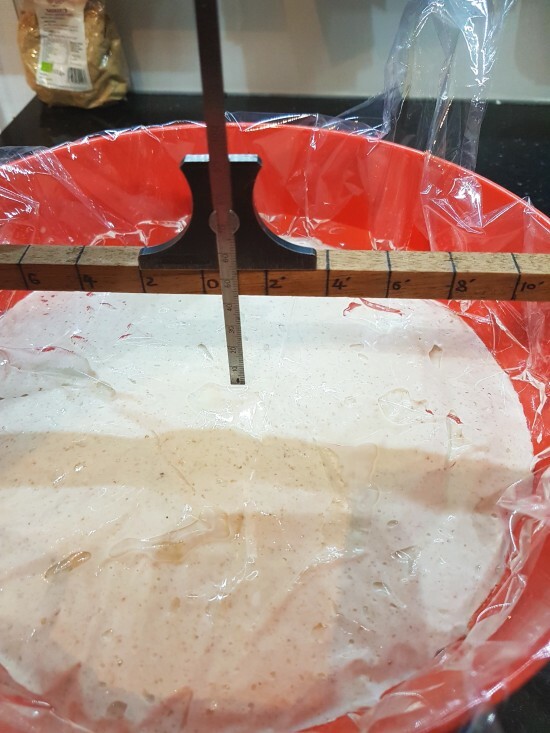 During my recent trials regarding bulk volume increase, I felt the need for a more accurate way to determine the volume of a piece of dough during bulk fermentation. first we start with a suitable bowl. Mine is classic bowl shaped with an open, accessible, top. I then "gauged" the bowl by adding known weights of water (weight in grams equals volume in ml) and measuring the distance from the bowl rim down to the surface of the water - the dip. From this I could produce a table of dip versus volume. when the actual bulk dough was in the bowl, I waited 30mins for the surface to level out (with sourdough, it won't rise during this time). then I sprayed the top of the dough with spray oil and gently pressed wide stretch wrap onto the dough surface. I poured a known volume of water on top of the stretch wrap until ther were no puddles - it took 500ml of water. I dipped the bowl and looked up the volume from my table; I subtracted the 500ml from this figure and this gave me the true dough volume. then I sucked off most of the water and carefully removed the stretch wrap. I repeated the procedure after 3.5hrs, when I thought the dough was well developed and discovered I had got a 60% increase in volume. Obviously, this is maybe not something to do every time, but, in my opinion, a very useful tool! Also if you make the same quantity of dough every time, with a similar hydration, then the start volume should be a given. My start volume for 1980g of 80% hydration dough (excl salt weight) was 1850ml. In another bake, my start vol for 1942g of 75% hydration dough was 1800ml. When you get to this level of work and determination, maybe it would make sense to take it even one more. If the curvature of the dome is more or less predictable, it might be easier to make a rigid same-shaped dome to fit tightly into the bottom of a transparent cylinder; then you could (almost, sort of...) use the volume markings on the side of the cylinder to read where the dough is touching the wall, and forget about judging the domed top of the dough. (If the rigid dome can be made accurately enough and easily enough, and if the curvature is sufficiently predictable.) There are going to be little errors (basically, too many little curved surfaces being falsely assumed to be straight) that cumulatively might be a problem, but maybe it would be good enough, or it might be possible to compensate for the errors.